This is one of those versatile builds that could be useful for a number of different tasks. Effects and dry signal in parallel, 3 channel splitter/mixer, 1 input 3 outputs for using multiple amps, 3 inputs into one output to use multiple instruments, convert serial effects loop into parallel ... and so on. I made it 3 channel so I could put two mono effects in parallel and then have the third channel to pass the dry signal via a patch lead if I was using digital effects and wanted them wet only, so as not to digitise the main dry signal. It can be easily adapted for more or less channels depending on what would suit you. Based on the AMZ splitter and a generic JFET mixer circuit. And I would, if I hadn't just bought a two channel mixer/splitter! what Jfets are these Mark? You should be able to use any JFETs in there. Try J201, 2N5457 etc, but I did the layout with a DGS layout so rather than twist pins or have to rearrange the layout it may be worth getting something like the 2N3819, 2SK117, 2SK170, 2SK246 or 2SK30 which have that pin arrangement. I want to built good clean buffer with 1 input and 3 output, no sends/returns/pots (I play guitar on 3 amps simultaneously). Can you give me advice which of your vero schematic can I use (I see also klon buffer http://tagboardeffects.blogspot.com/2011/04/klon-buffer.html). I also in which way can I add phase reverse switches, ground switches, or maybe have 3 isolated outputs?? Really thanks for undestanding me and answer. Thanks, and what transistor can I use? Mark will electrolytics also work ? I know you have already said anything larger than 1uf should be a electrolytic cap but does being polarised make a difference in this circuit? or should I just stick to non polarised caps like what your showing here ? Electrolytics will work fine. I have radial poly and box caps up to 2.2uf so personally I'd use them, but there's nothing to stop you using electros instead. In all cases the positive legs would be connected to source. excellent Had already placed them on my breadboard as markers and by luck only needed to rotate one of them and a damed sight cheaper to buy . Im still painting by numbers i fear. hi all, first post here; tagboard looks like a great way to craft effects. just wanting to know how i'd modify the circuit for the aforementioned 3 inputs-1 output idea? Would there be a way to add a polarity switch to each channel? And maybe a on and off switch? I'm gonna build this once I have some time. I really do need something like this for practice scenarios, where we may only have one amp! probably a stupid question but could mosfet like the 2n7000? please could you tell me if this would work well on a bass setup? also would it be ok to use 1nf electro caps? When I use it as a parallel mixer, I can get the full volume only when I max the 3 pots. Any way I can increase the 1 or 2 channel's volume level? Would this be OK to use to mix 3 mics into a PA? Yes it should be fine, although you could do it with a cut down version of the layout. Just ignore the input and sends and take the mics straight into the returns. 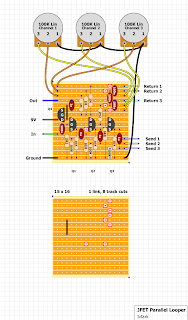 If you want to save space just remove the bottom 8 rows and all the components which connect there including the 2M2 resistor between Q2 and Q3. Once you've done that you'll be able to shift the mixing components at the top of the layout closer together which I think will save you 4 columns of width too. You'll need to add a ground row somewhere though for the 6K8 resistor. OK cool thanks, would the quad opamp splitter do the same job as this? I just have a spare TL074 to use up. can i give a 3pdt switch to bypass the signal? i'm trying to go deeper in how things work so i have that kind of thoughts really often...!!! had that thought just before starting building this. can i replace those j-fets with a tl074 ic? mark i have questions.does this one uses any footswitch? i'm confused cause i'm trying to find out how it works and what should i expect from it before building it. is it something like boss line selector maybe?can i switch between channels somehow? or there are just the pots that allow you to mix the parallel signals?i saw a video with that boss and it was great. If a patch cable is used in one of the channels, that will pass the dry signal to the output allowing you to mix effects in with your untouched dry. It's basically just a utility pedal, but I would use it in an amps effect loop so I can run two rack effect wet only so my dry signal isn't digitised. And with that in mind this can turn a series loop into a parallel loop so it has other advantages when used in the loop. build it today but no sound out of it.i've used 2n5458 so i turned them around to fit the pinout.right? and i've used 1μF electrolytic caps with their negative legs looking up.i took that risk cause i thought they sould go to ground through 1M resistor.is that ok? or this is why i don't get anything? i'll return that favor to the community! when i'll become an expert too!!!!! no...i don't have...my voltages seem to go to zero at send wires.just after 1μf caps. i've soldered the electrolytic 1μf caps in the wrong way...now i desoldered-resoldered them and again nothing. i'm starting to think i may burned them out...anyway...i must build a probe too...i have to leave for work now...i'm a cook by the way...agrrrrrrrrrrr...wanted to finish it before work but...tomorrow! thanks man!i'll let you know how it will go. What sort of cooking do you do, traditional Greek? haha! mine too...yes. mostly traditional greek, but a lot of times we only keep the base traditional and we're experimenting on flavors...something like socketing the flavors to the traditional recipe and experimenting with them till you find the one that fits better with your taste!!!!! it's not the 1μf caps by the way....i must get a probe...did you build it for you? it works fine but there is something like volume drop.i've tested it with test box that has a switch, and the "dry" signal of the mixer is a little bit darker and with less volume than the dry signal without the mixer. Well unity gain buffers are actually not quite unity gain and the signal goes through 2 before the output so I suppose a slight loss of volume should be expected. I'm wondering whether it would be better to make the last buffer a booster so each channel level control could get you well above unity. Let me have a think about the best way to adapt it. A : If I want to split my signal in 3 independent channels, should I use the "in jack" as the input and the 3 "send jacks" as outputs, and then don't use the "out jack" ? B : If I want to mix 3 audio sources, should I use the "return jacks" as inputs and the " out jack" as the output ? Is is possible to use A and B at the same time : One guitar => 3 channels for effects in parallel => return and mix everything to send the signal to one amp ? I hope i've been clear enough...Sorry for my english, I'm french. Many thanks anyway for all the amazing job you've done on this site. Hey, is this active or passive. Sorry of its a newbie question, is this the same thing as the saturn works active parrallel mixer 3 channel. crazy idea again...i've build a synth for a gift for my best friend's birthday. took from paul in the lab devils triangle drone synth and devils drone sequencer, and atari punk consol. all in a box. those effects don't have an input. they just produce noise...!!! now i want to take all 3 outputs through this looper and have a volume pot for each one and then a master volume.i've build it successfully before for my guitar and it's great.i always use it. but now as i said i don't need the sent jack. my question is can i just use the return part of the schematic for this idea?or is there something from the sent section that is needed to make it work? i've build this idea i had in the comment above. build just the return part and it worked great. Could you help me with this? It would be really appreciated! and easy.just look at the schematic mark posted and you'll understand how you could build this. you just have to add 2 more paths of the sent-return parts. but you'll need an other layout for this idea. I want to make it sound louder than bypass (because I put a volume pot in it). Which transistors must I change ? For a bigger or smaller value ? I am trying to build a 4 in, mono/stereo (switchable) out. what schematics do I need to combine to do this? Hey guys! Any update on adding a phase reversal switch? In case it s not practical in this FET implementation, is there another opamp channel mixer with phase reversal capabilities you d suggest trying out? Hello. I've been searching for a parallel looper with pickup-like output impedance to play well with germanium fuzzs. Buffers are a worry hear unless the circuit is built to play well with things like fuzz face, fuzz factory and tons of other "fuzzs with a nice clean up". Yeap, that's probably the thing. I thought that the easiest way to control the levels would be having level cut for all sends and this where needed, but mostly having a boost knob before the splitting/ vol cuts or pickup simulators.. What I basically want is having unity gain in the clean channel and be able to hit the sweet spots of my pedals adjusting levels, of course, without tone loss or coloration. buffers get rid of low end right? what about the input tranformer idea, anyone tried that? If you wanted to be able to pull out one of the effects live (I'm thinking you built a fuzz with low/Mid/High fuzzes (Mastotron/overdrive/Foxxtone or you had a rockabilly clean slapback bringing in and out a fuzzwrite),could you use footswitches? Clearly bypass wiring won't work as the bypass would pass dry signal. If you had a footswitch at the end of the return send that sent the returned signal to ground, would it mess the rest of the operation up? - Does this pedal work fine for bass or should I change the input capacitor? - I'd like to mix a loop signal (or 2 loops efects) with a clean signal to achieve a stereo-like effect (one bass distorted and one another one clean). Simply bypassing the third channel (just welding a wire from send3 to return3) would work or should I add a resistor beetween them? What do you suggest? -Does type of JFET matter? Looks like I only the only ones I have are 2N5458's and J201's. 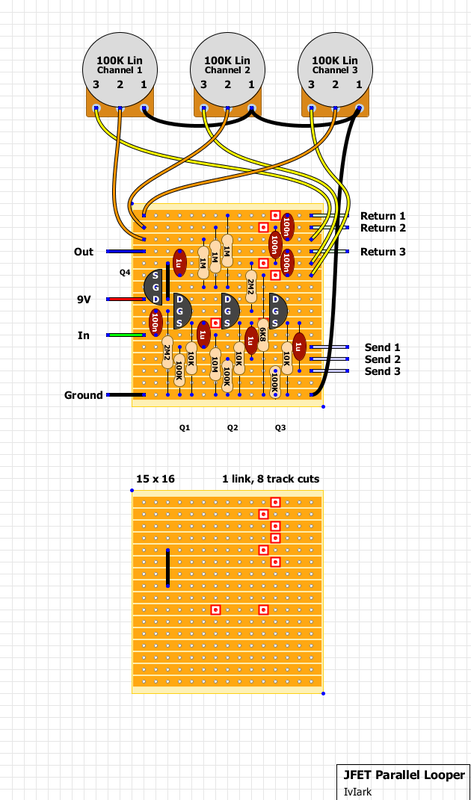 -If I was to add a bypass switch for each two of the loops, would it matter where in the signal path it would go? Thanks, I look forward to having some fun with this build. Just built this up successfully but felt the need to boost at the end after it's all summed together because it is a little quiet. Super hard on is doing that and when these two are combined i get a hum when i roll off my guitars volume. Im trying to research the cause for this but not coming up with anything relative enough to this particular scenario. Anyone got an educated guess as to what might be happening here? Any sources of info i can read up on? Never had this problem before. I think from memory the pots on the thin line mustang are 250k. JFET parallel looper > SHO > little transistor amp. Buzzing only happens when guitar volume fully rolled off, cuts out just a touch above zero. Thanks for such a great site. I just finished a box with 2 Tillman gain switch preamps that can run individually or mixed together via switched output jacks to the mixer portion of this looper, cutting in at the 10M resistors. Couldn't have done it without yous!